Top: Optical images of Scheila at three different epochs with different telescopes. Images of the triple dust tails were taken on the 12th and 19th of December 2010 using the Murikabushi Telescope. Bottom: Suprime-Cam on the Subaru Telescope captured this image of the linear structure on the 2nd of March 2011. (PhysOrg.com) -- A research team of planetary scientists and astronomers, primarily from Seoul National University, the National Astronomical Observatory of Japan (NAOJ), the Institute of Space and Astronautical Science (ISAS), and Kobe University, has explained the formation of peculiar triple dust tails from the asteroid Scheila (asteroid #596). The researchers concluded that another asteroid about 20-50 meters in size impacted Scheila from behind on December 3, 2010 and accounted for its unusual brightness and form. On December 11.4, 2010, Steve Larson of the Catalina Sky Survey noticed an odd brightness from Scheila, an asteroid on the outer region of the main belt of asteroids that orbit in an area between Mars and Jupiter. Three streams of dust appeared to trail from the asteroid. 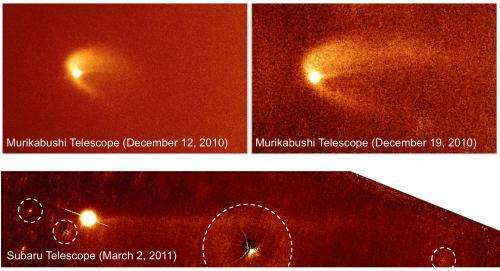 Data from NASA's Swift Satellite and the Hubble Space Telescope suggested that a smaller asteroid's impact was the likely trigger for the appearance of comet-like tails from Scheila. However, questions remained about the date when the dust emission occurred and how the triple dust tails formed. The current research team sought answers to these queries. Soon after reports of Scheila's unusual brightness, the current research team used the Subaru Prime Focus Camera (Suprime-Cam) on the Subaru Telescope (8.2 m), the Ishigakijima Astronomical Observatory Murikabushi Telescope (1.05 m), and the University of Hawaii 2.2 m Telescope to make optical observations of these mysterious dust trails over a three-month period. The top of Figure 1 shows images of the development of the dust trails taken by the Murikabushi Telescope on the 12th and 19th of December 2010. Although asteroids generally look like points when observed from Earth, Scheila looked like a comet. As the three streaks of dust streamed from the asteroid, their surface brightness decreased. Eventually the dust clouds became undetectable, and then a faint linear structure appeared. The bottom of Figure 1 shows the image obtained by Subaru Telescope on March 2, 2011. Based on these images of the linear structure, the scientists determined a dust emission date of December 3.5+/-1, 2010. Steve Larson of the Catalina Sky Survey noticed that Scheila had a slightly diffuse appearance on December 3.4, 2010. Therefore, it is likely that the collision of the asteroids occurred within the short time between December 2 12:00 UT and December 3 10:00 UT. 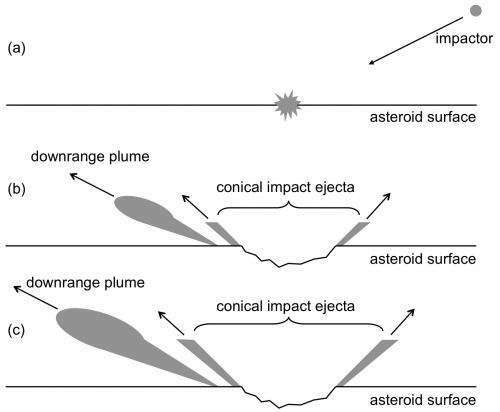 Sequence of events after an oblique impact: (a) Object impacts another and generates a shock wave; (b) and (c) increased development of two prominent features, i.e., a downrange plume and conical impact ejecta. The downrange plume results from the fragmentation or sometimes the evaporation of the impacting object while the conical impact ejecta come from the physical destruction of the impacted object when the shock wave spreads from the site of impact and scoops up materials from it. To explain the formation of Scheila's triple dust tails, the research team conducted a computer simulation of Scheila's dust emission on December 3th. Their simulation was based on information gained through impact experiments in a laboratory at ISAS, a hypervelocity impact facility and division of the Japan Aerospace Exploration Agency (JAXA). Figure 2 shows the ejecta produced by an oblique impact, which was not a head-on collision. Two prominent features characterize oblique impacts and the shock waves generated by them. One feature, a downrange plume, occurs in a direction downrange from the impact site and results from the fragmentation or sometimes evaporation of the object that impacted another. A second feature occurs during the physical destruction of the impacted object; a shock wave spreads from the impact site, scoops out materials (conical impact ejecta), and forms an impact crater. The axis of the cone of ejecta is roughly perpendicular to the surface at the impact site. 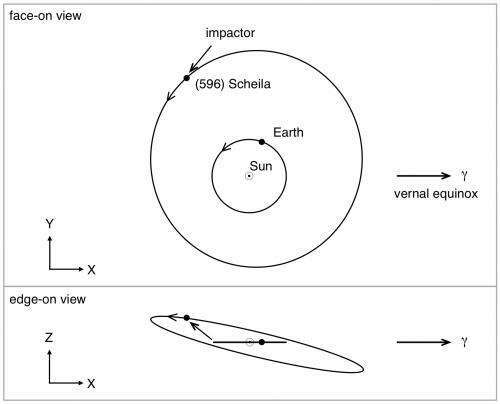 The team reasoned that these two processes caused the ejection of Scheila's dust particles and that sunlight pushed them away from the asteroid. After performing a tremendous number of computer simulations under different conditions, they could only duplicate their observed images when an object struck Scheilas surface from behind (Figures 3 and 4). Orbits of the impacting asteroid and Scheila on December 3, 2010, assuming an impact angle of 45° relative to the surface normal vector. Top: Face-on view, projected on the ecliptic plane. Bottom: Edge-on view, projected on the X-Z plane. Image showing the result of a vast number of computer simulations to reproduce the shape of Scheila's triple dust tails observed on December 12, 2010. The researchers reasoned that the downrange plume and the conical impact ejecta produced the dust particles, which sunlight pushed away from the asteroid. The image on the right is the best-fit match for the observed image on the left. The downrange plume explains the appearance of the prominent northern feature (1) while the conical impact ejecta explain the remaining two structures (2)(3). Taking all of the evidence into accounttheir observations and simulations --the research team concluded that there is only one way to explain the mysterious brightness and triple trails of dust from Scheila. A smaller asteroid obliquely impacted Scheila from behind. -- Ishiguro et al. 2011, Astrophysical Journal Letters 740, L11, "Observational Evidences for Impact on the Main-Belt Asteroid (596) Scheila"
-- Ishiguro et al. 2011, Astrophysical Journal Letters, 741, L24, "Interpretation of (596) Scheila's Triple Dust Tails"